Disadvantaged pupil attainment has risen, including among poor pupils from black, Asian and minority ethnic communities. 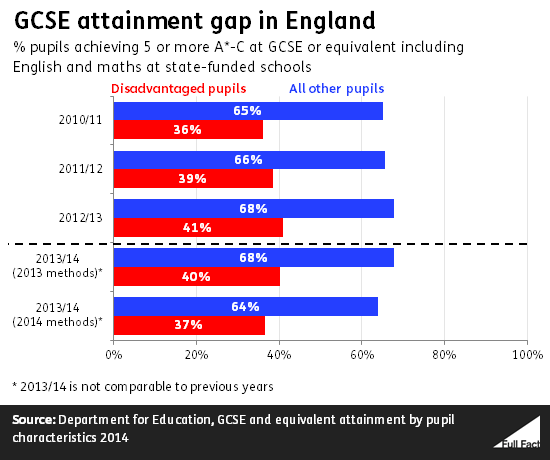 Broadly yes, but there's not such a clear trend for the attainment gap. "Disadvantaged pupil attainment has risen, including among poor pupils from black, Asian and minority ethnic communities." The Pupil Premium provides additional money to schools in England to raise the attainment of disadvantaged pupils and close the gap between them and their peers. The Education Secretary has pointed to attainment figures as evidence of the success of the policy. Disadvantaged pupils are those who are either eligible for means-tested free school meals (including those who have been eligible in the last six years) or have been looked after in local authority care. Attainment at primary and secondary school by these pupils has mostly improved, but there's not a clear trend in the attainment gap between these children and their peers. The gap has narrowed slightly since 2011, but remains wide. The National Audit Office (NAO) has said it will take time for the Pupil Premium's impact to become clear. The performance of black, Asian, mixed ethnicity and Chinese pupils eligible for free school meals has, for the most part, been improving, and their performance remains better than white pupils eligible for the meals. About three in 10 pupils are classed by the Department for Education as coming from disadvantaged backgrounds and so as eligible for Pupil Premium funding. That's two million out of seven million pupils (aged four to 16 years old) in publicly funded schools. At primary level (key stage two, ages seven to 11), the proportion of disadvantaged pupils achieving the expected level in reading, writing and maths has been increasing—from 61% in 2012 to 67% in 2014. The equivalent attainment gap at primary level between disadvantaged pupils and their peers has narrowed by 2 percentage points since 2012 to 16 percentage points. At secondary level (GCSE, age 16) the proportion of disadvantaged pupils achieving five or more A*-C grades at GCSE, including English and maths, had been increasing, from 36.1% in 2010/11 to 40.9% in 2012/13. At the same time, the attainment gap between these pupils and their peers had also been narrowing, from 29 percentage points to 27 percentage points. GCSE attainment in 2013/14 fell for both groups—slightly more so for disadvantaged pupils, meaning the gap has increased slightly. We can't read too much into this though as changes to the way GCSEs are counted in the statistics have had a significant impact on the results. The Department publishes a rough set of figures for 2013/14 which take account of this change. These show a slightly smaller fall in performance for both disadvantaged pupils and all other pupils. This could still be an impact of the reforms though (for example, the statistics can't account for changing behaviour by schools), so we won't know until future years what the longer term trend is. There are other figures available, for example taking the proportion achieving five or more A*-C grades regardless of whether they're in English and maths. The ones we refer to here are the ones the Department cites in its guidance to schools on reviewing their Pupil Premium expenditure. "no clear trend has yet been established using any measure". It said the bigger improvements were seen between 2011 and 2012, with smaller changes since. That doesn't necessarily mean the attainment gap isn't improving—it means it's too early to say. Black, Asian, mixed ethnicity and Chinese pupils eligible for free school meals perform better than white pupils eligible for the meals. Aside from some fluctuations in performance for Chinese pupils (and aside from the 2013/14 GCSE figures), key stage two and GCSE performance by these groups has been improving. Performance of white pupils is consistently the lowest out of these four groups, stretching back to 2009/10 for GCSE and 2012 for key stage two (the furthest back we can compare). Looking at all pupils (not just those on free school meals), those from a black background are the lowest performing ethnic grouping at key stage two (at 76% in 2014). If a parent doesn't register their child for free school meals then they won't show up in the figures. The Department's last estimate was that about 160,000 eligible pupils had not registered in 2013—a rate of 11%. In some areas it's substantially higher—for example, in Slough it's more than 30%, according to the National Audit Office. There's been some suggestion that this rate will get worse with the introduction of free school meals for all children aged four to seven. Pupils receive the meals regardless of whether they're registered, but not registering means the school doesn't receive Pupil Premium funding for that child. But the Department's research has suggested the policy has not had this impact, according to the NAO. There's also the suggestion that some low-income pupils aren't eligible for free school meals—75% of school leaders said in a survey by the NAO that at least some pupils fell under this bracket. The Department is currently working on a new measure of disadvantaged pupils' attainment, which would avoid reforms such as the new GCSE grades affecting comparability in the statistics over time. For more information on what schools are spending their Pupil Premium funding on, see the NAO's report or our previous factcheck looking at Ofsted's analysis of the policy.